In March 1907, three commissioners met in Sandpoint to conduct business of a new Idaho county named Bonner. Mr. Clark of Granite represented the southern interests of the county. Mr. Roth from Clark Fork represented those in the east. Mr. Dunn, who was from up north at Moravia, was sort of a spoilsport. He voted against nearly everything that the other two voted for. Bonner County was named after Edwin L. Bonner, who established a ferry across the Kootenai River 30 miles north of Sandpoint, and was formed from the north half of Kootenai County. It stretched 70 miles from near the south end of Lake Pend Oreille to the border with Canada and took up the entirety of the Idaho Panhandle. The Panhandle is 44 miles wide at the top and 46 at the bottom (due to the convergence of true north upon itself as the pole is approached), so it averages out at 45 miles. The original county had some 3,150 square miles, roughly 2 million acres, most of it mountains and timber, split down the middle by the great Purcell Trench. In 1915, Boundary County was formed from the northeastern corner of Bonner County, and included a 10-mile-wide strip all the way across the top of the Panhandle, cheating Bonner County of an international border, but leaving 1,950 square miles. Boundary County got 1,200 square miles, Deep Creek, the Kootenai River and the town named for Edwin Bonner. Bonners Ferry became the county seat. Bonner County kept two of Idaho’s most beautiful lakes, Priest and Pend Oreille, and Sandpoint remained its county seat. It has been a century since Dunn cast his first no vote and a lot has happened, in spite of his reluctance. The county is gearing up for a birthday party. The Bonner County Centennial Committee headed by Brian Orr, a former Bonner County commissioner, is planning the celebration. Bonner County Historical Society President Gary Pietsch, along with 17 others, is on the committee. “We’ve been meeting since January of 2006. Part of our plan is to ask every community to put on their own celebration. The theme, which Marcella Nelson, came up with, is ‘Bonner County: 100 Years of Living.’ ” Nelson is another committee member who is representing the Ponderay Community Development Corporation. The committee has sent letters to community and non-profit organizations in the county asking them to build celebration this coming year around the community theme. The time for celebrating history is also being turned into a time for gathering history. In cooperation with the Bonner County Historical Society, the committee has been working with third and seventh grade teachers to develop a curriculum in which students will be assigned to conduct oral and written interviews with relatives. These histories will be integrated into a Web site, www.bonnercountycentury.org, being developed in cooperation with the Museum and Keokee Creative Group. “This will be an interactive site,” Bonner County Historical Society Museum Curator Ann Ferguson said, “with a map of Bonner County with place names. Click on a name, like Selle or Wrencoe, and a history of that place will come up. There will be photos and written and oral histories. We hope to offer a choice of audio or written versions of the oral histories. Bonner County has kept good track of its time. There is an incredible amount of material available at the Bonner County, Priest Lake and Priest River Museums. Bonner County Museum’s collection alone is daunting, even if a visitor talks to no one. But Curator Ferguson and museum volunteers (read “history junkies”) like Eva Whitehead, Vern Eskridge and Dale Selle can fill a head with factoids faster than you can say “Sandpoint Daily News Bulletin.” It’s nearly impossible to know where to start. So, we put together a random sampling of the first 100 years of life in Bonner County (see timeline starting on page 48). That’s not near all, of course. Missing, I’m sure, are a couple of hundred thousand important events – at least that many. But there is one other bit of trivia that I thought was important – and fitting – enough to save for last. When Boundary County was formed in 1915, Bonner County might have lost nearly 40 percent of its area and its namesake town, but it also got rid of that naysayer, Mr. Dunn. Special thanks is due to historian Nancy Renk, Ann Ferguson and the Bonner County Historical Society. 1907 Bonner County is formed in February out of Kootenai County. 1907 Westmond Cemetery, which lies just east of Highway 95 at Westmond, is created. 1907 Page Hospital opens in Sandpoint in April. 1910 A huge fire burns up much of the timber inventory in the east end of the county. 1912 Louis Poirier and three others organize the Blanchard Trading Company. 1914 The Priest River Times is founded. 1916 Sandpoint Boy Scout Troop No. 1 is chartered. 1920 Nell Irion of Sandpoint becomes the first woman from Idaho to run for Congress. She loses but later becomes the first Sandpoint city councilwoman in 1936. 1921 Another Nell, silent film star Shipman, makes “The Grub-Stake” at Priest Lake. 1922 The Priest River Public Library begins in the form of a women’s group called The Weekend Club. The library formally opens in 1926. 1930s The last of the annual summer powwows are held by Salish peoples on the shores of Lake Pend Oreille at Sandpoint. 1932 Selle Grange is organized on June 14, but the first grange in Bonner County was organized at Freeman Lake in 1919. 1931 Humbird Lumber, begun in 1900, closes its lakeside mill at Sandpoint for good in November. The planer at Kootenai closes in 1934. 1932 The Tam O’Shanter Bar (or Tervan, as it is known locally) opens and still serves today, having survived the Depression, thousand of thirsty loggers and ski patrollers, and at least one unfriendly buyout attempt. 1933 When the existing Long Bridge needs replacement, an alternate route proposal is made, advocating a crossing at Rocky Point near Dover. The new wooden bridge, almost 2 miles long, is completed in 1934. 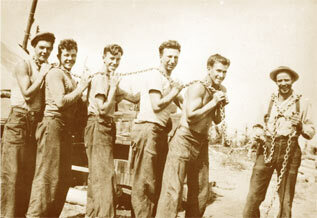 1933 The Civilian Conservation Corps (CCC) begins operations, becoming a savior to many during the Depression. By 1936, there are 20 permanent camps in North Idaho. Many of the young men serving in the CCC are not from Bonner County but from cities all around the country. They plant millions of trees, put in hundreds of thousands of days fighting fires, string thousands of miles of telephone wire and marry dozens of local girls. 1935 Northern Lights, the first Rural Electrification Cooperative west of the Mississippi River, is organized. In 2006, it serves thousands of customers in Bonner and Boundary counties in Idaho and Sanders and Lincoln counties in Montana. 1936 Of the rural population in Bonner County, 20 percent is on relief. 1939 Jim Brown starts Sand Creek Lumber Company, soon to be Pack River Lumber, with $500 (borrowed). He begins by salvaging Humbird logs off the bottom of Kootenai Bay. Late 1930s The highway to Hope and Clark Fork is completed by Works Progress Administration crews. Not coincidentally, the last big steamer on Lake Pend Oreille, the Western, is burned and sunk in 1939. 1942 Farragut Naval Training Station is built near Bayview, providing Bonner County with hundreds of much-needed jobs. Once again, young men from elsewhere marry Bonner County girls. 1949 The last log drive in Bonner County down the Priest River happens. 1951 Construction on Cabinet Gorge Dam begins. It goes online in 1952. Albeni Falls Dam goes online in 1955. 1953 Cabinet School is closed, along with dozens of other small Bonner County schools, in a consolidation into one school district, No. 81. Eva Whitehead was the last teacher at Cabinet. 1956 Diamond Match closes the last of its logging camps at Priest Lake. 1956 The last wooden long bridge is replaced with a steel-and-concrete structure. The State proposes running a highway bypass parallel to the Northern Pacific Railroad on the east side of Sand Creek. 1957 The last ferry in Bonner County closes. Folks have a much longer trip from Hoodoo Valley to Laclede after that. 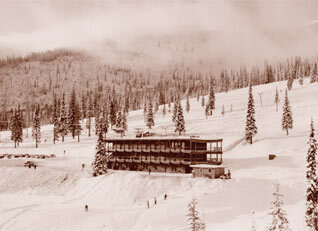 1963 Schweitzer Basin opens in Bonner County with one chairlift. It was and still is powered by electricity from Northern Lights, Inc.
1973 Much of downtown Priest River burns. 1974 The first Pend Oreille Arts Council Arts and Crafts Fair is held in front of the Edgewater in Sandpoint. 1977 Bonner County Fair celebrates its 50th anniversary. 1980 The last loggers celebration is held at Priest River. 1982 First Festival at Sandpoint is held. 1988 Coldwater Creek is born in Ann and Dennis Pence’s closet. 1991 The first issue of Sandpoint Magazine is published. 1998 Harbor Resorts acquires Schweitzer Mountain Resort out of receivership from U.S. Bank. 2001 Bonner County’s seat, Sandpoint, celebrates its 100th birthday. 2005 Elaine Savage of Priest River becomes first female Bonner County sheriff.